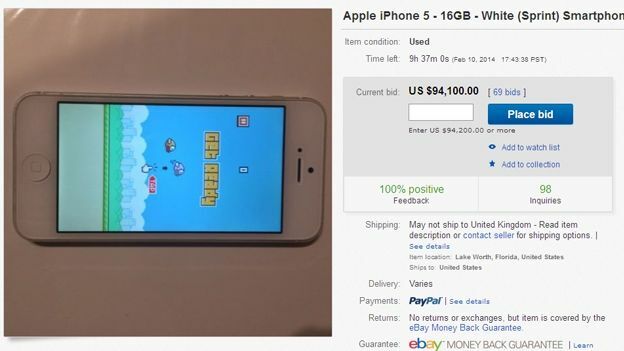 Bidding for a 16GB iPhone 5 with Flappy Bird installed reached $90,000 dollars overnight, the listing has since been removed, it's not clear whether that was by eBay or the user selling the item. A number of second hand devices with the viral game pre-installed were listed on eBay within hours of Flappy Bird creator Dong Nguyen removing the game from iPhone and Android app stores yesterday. Although the game can no longer be downloaded, it is still available to play on devices if already installed and many entrepreneurial eBay users have seized the opportunity to cash in on the game's popularity. The game consists of flying a bird through pipes by tapping the screen repeatedly. At last look the $94,100 16gb iPhone had 62 bids. Although this particular price tag appears unbelievable and excessive, dozens of iPhones with Flappy Bird installed are now appearing on eBay and although cheaper that this particular listing they're still leaning on the side of excessive for a second hand smartphone..
Flappy Bird has become the number one iOS and Android game recently, despite being released in May 2013. It has now been downloaded more than 50 million times and was said to be making an estimated $50,000 in advertising revenue each day. The sudden increase in download volumes has prompted speculation that bots were been deployed to download the app thousands of times. Nyugen stated that the success of his notoriously hard game ruined his simple life, but he will continue to make games.